Osram scores a hat-trick featuring in the top ranks of the specialist journal Elektronik readers award for three consecutive years. For 19 years, Elektronik, one of Germany’s most widely read electronics trade journals for industry markets has asked its readers to vote for their product of the year. The editors provide a pre-selection of products, in various categories, which have, in their opinion, attracted outstanding attention. The readers usually choose products that feature considerable technological advances or offer the greatest progress for designers in their applications. In the optoelectronics category, infrared LEDs from Osram Opto Semiconductors have ranked among the top three for three consecutive years. In 2017, Elektronik readers awarded the first place to the SFH 4735. This broadband infrared emitter provides the first compact light source for near-infrared spectroscopy. It paves the way for this method of measurement to enter the consumer sector. Soon it will be possible for users to have, for instance, USB-stick-like add-ons to fit to their smartphones. These will allow them to analyze their food for its freshness, nutrient or calorie content. In order to come up with this novel solution, Osram Opto Semiconductors used converter technology for an infrared emitter for the first time. The SFH 4735 is based on a blue 1 mm2 chip in UX:3 technology, the light of which is converted into infrared radiation with the aid of an especially developed phosphor converter. 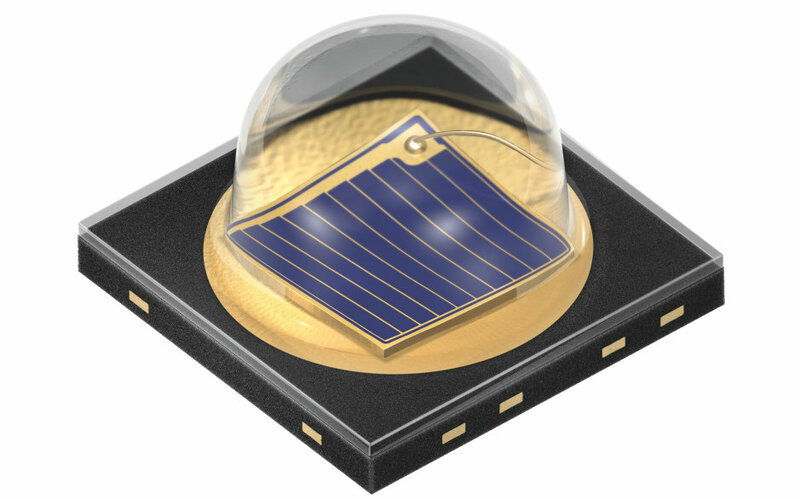 The chip is mounted in Osram’s proven and compact Oslon Black Flat package. For nearly ten years, Osram has been systematically developing its portfolio of high power infrared LEDs. These emitters provide the necessary illumination to ensure high image quality for camera applications such as surveillance systems. The company was one of the first suppliers to offer a high power infrared LED for camera-based sensors in cars such as night vision assistants. With each product generation, Osram has increased both the output power and the efficiency of its 850 nm LEDs, which have repeatedly set records. Elektronik readers have honored this achievement twice, first in 2015 and again in 2016. The SFH 4715AS won third place in the “Product of the year 2016” awards. Osram had increased the output of its IR Oslon Black family for the second time in just six months. Based on the latest chip design, an optimized package and nanostack technology, the SFH 4715AS provides up to 1.34 watts of optical output at 1 amp. In pulse operation, it delivers more than 3.5 watts power at 3 amps. Depending on the application design, the new emitter can provide illumination over a distance of more than 100 meters. As a light source for surveillance cameras, it allows for longer ranges without having to make changes in the design. In 2015, Elektronik readers honored the predecessor unit, the SFH 4715A, with the second place in their poll. At the time, this emitter was the most efficient infrared power LED at a 1 amp drive current. With 48% electro-optical efficiency and 0.8 watts of output, the SFH 4715A enabled camera systems with greater ranges. Alternatively, the same range could be achieved using fewer components than before, yielding considerable cost benefits. The key applications for the SFH 4715A include camera-based surveillance systems and automotive night vision assistants. Also in 2015, another system based on components from Osram Opto Semiconductors won the “Product of the year” in the automotive category: The Osram Laser light for cars.